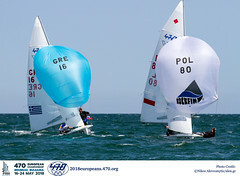 Sunday’s first scheduled day of racing was blown out for the junior crews gathered in Thessaloniki, Greece for the 2009 470 Junior World Championships. The renowned local wind, the Vardari, which takes its name from the local River Vardar, has the reputation of appearing suddenly – and it did yesterday. A steady wind of 28-32 knots, with gusts up to 36 knots, gave the Principal Race Officer Athanasios Papantoniou (GRE) the task of deciding to keep the sailors ashore. Equipment breakages in the opening day of the Championships would not have been on anyone’s wish list. Hoping for a break in the weather, racing was postponed under 1600 hours, until finally Papantoniou made the “no racing” decision. 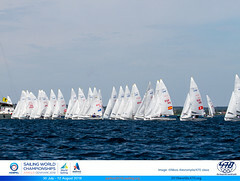 The 79 crews, representing 25 nations are sailing in two events, the men’s/mixed and women’s. 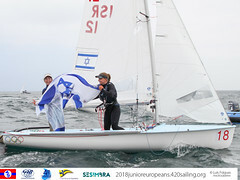 The men’s/mixed fleet of 54 entries has been split into two fleets, based on their world rankings, and the women are sailing as one fleet. The qualification series is taking place through until 14 July, with the final series from 15-18 July.